Roland Corporation is a leading manufacturer and distributor of electronic musical instruments, including keyboards and synthesizers, guitar products, electronic percussion, digital recording equipment, amplifiers, and audio processing devices. With over 40 years of innovation that continues to shape the sound of modern music, Roland sets the standards in music technology for the world to follow. At the heart of Roland Corporation is a passion for music—the special bond between musician and instrument, art and technology. It is truly the reflection of the company’s founder, Ikutaro Kakehashi. The marriage between the tradition of RODGERS, a prestigious classical organ brand, and Roland’s leading-edge digital technologies began in 1988, when Roland purchased the Rodgers Instrument Corporation. 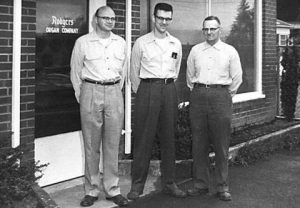 In January 2016, the Vandeweerd family from Holland acquired Rodgers Instruments from the Roland Corporation. The Vandeweerd family has achieved worldwide success for decades with prominent organ brands Johannus, Makin, and Copeman Hart. Now with Rodgers Instruments as their newest family member, the Vandeweerds are the world’s market leader for digital and hybrid pipe organs. The acquisition of Rodgers represents an important step for inspiration, innovation, and assurance. Thanks to the strength of shared knowledge and experience, a worldwide range of products and services and the common goal of producing high-quality organs for years to come, Rodgers’ American sound will continue to resonate in the future.